Full of scientific facts, humor and just the right amount of yuck, How Rude! will make you scream "gross!" 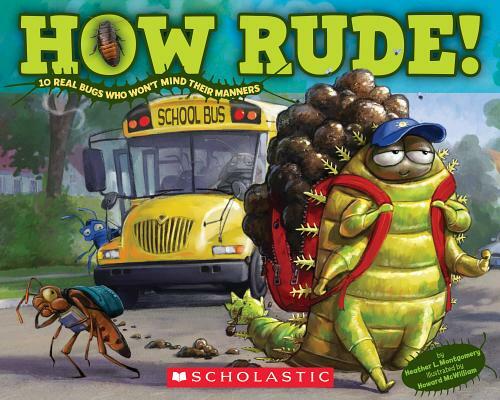 Featuring a countdown of the top 10 bad bugs who just won't mind their manners. One part illustration and one part photography, How Rude! is hilarious, informative, and seriously gross! Heather Montgomery is passionate about nature! She has taught science outdoors and in the classroom, plus directed an environmental education center. She is the author of several nonfiction children’s books, including the Wild About Snakes series for Capstone Press. Heather has a B.S. in Biology and a M.S. in environmental education. Learn more about her at www.HeatherLMontgomery.com. Howard McWilliam is the illustrator of DINOSAUR CHRISTMAS, by Jerry Pallotta; I NEED MY MONSTER, by Amanda Noll; and WHEN A DRAGON MOVES IN, by Jodi Moore. He lives in Kingston Upon Thames, England, with his wife, Rebecca. For more information, go to www.mcbill.plus.com.